African Chrome Fields (ACF), which says it is Zimbabwe’s biggest exporter of chromium, has launched a state-of-the-art aluminothermic plant which is set to further increase the company’s range of products through the addition of Ultra Low Carbon High Grade Ferrochrome (ULCHGFeCr) and boost employment across ACF’s operations. Modern Mining travelled to Zimbabwe to attend the launch. One of the seven wash plants that ACF operates (photo: ACF). Located east of Kwekwe in Midlands Province in the vicinity of the Sebakwe Dam, the plant was officially opened on 25 July by the President of Zimbabwe, Emmerson Mnangagwa. The event was attended by a number of VIPs including Winston Chitando, the country’s Minister of Mines and Mining Development, a media group and thousands of guests from surrounding communities. With the opening taking place just a few days before Zimbabwe’s elections, President Mnangagwa was in electioneering mood. In his address to guests, he described himself as “Mr Ground Breaking”, a reference to the number of projects he has inaugurated since becoming Zimbabwe’s President in November last year. In the mining field, these projects have included the Eureka gold mine and the Shabanie-Mashaba Mine (SMM) asbestos mining operation, which have both reportedly been re-opened, as well as the new Mhondoro-Ngezi platinum mining venture of Karo Resources. Ground-breaking on the Karo project took place on the day before the launch of ACF’s new plant. The technologically-advanced aluminothermic plant will initially produce 300 tonnes per month of ULCHGFeCr and is expected to ramp-up to 600 tonnes of ULCHGFeCr per month at full production. Said to be the first of its type in Africa, the plant creates certain by-products that have economic value themselves and will be sold, thus providing a secondary income from the facility. The launch of the plant brings with it the creation of 50 new jobs, bringing the total number of employees at ACF to over 1 250, around 40 of them expats. The plant – which uses a unique smelting technology based on an exothermic aluminothermic reaction – will increase the economic value of the high grade chromite ore ACF produces by removing large quantities of gangue minerals, resulting in the production of a higher grade ferrochrome with minimum impurities. The plant was designed in-house by a team led by ACF’s Chief Technical Officer, John Drummond, with Xram Technologies, a South African company specialising in pyrometallurgical engineering, providing some specialist assistance. It was brought on line just over 10 months from ACF receiving approval for the project from Zimbabwe’s Environmental Agency. According to Drummond, the specific ‘recipe’ and know-how of the aluminothermic plant is proprietary to ACF. In principle, at least, the process is simple and involves high-grade chromite, aluminium powder and accelerants being blended and then ignited in a crucible inside a reaction chamber. The ‘burn’ takes just two or three minutes – with the temperature reaching around 2 000 deg C – and results in two products being produced – the Ultra Low Carbon High Grade Ferrochrome, which is the primary product, and a high-grade alumina slag which can be used as a refractory material. The dust from the process is collected in a baghouse and also has value as it can be used as a cement additive in refractory applications. The main feedstock for the process, the chromite ore, is mined by ACF in an operation which is possibly unique on a large scale. What is unusual about the resource is that it is alluvial in nature – the result of weathering over long periods of time of the chrome seams of the Great Dyke, a process which has resulted in chrome fines being deposited in valleys on the flank of the dyke. The material of interest to ACF occurs at depths ranging from a few millimetres up to about 3 m from surface. Richardson, a metallurgist by training who was previously CEO of Tharisa Minerals in South Africa before joining ACF in May last year, adds that in certain areas where the washable component of the resource is very low, ACF carries out pre-screening using Pilot Crushtec mobile plants to avoid trucking excessive amounts of material for processing. 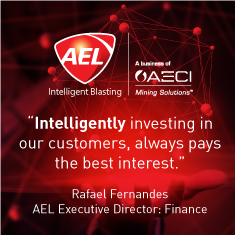 The mining is carried out in-house by ACF which uses a mining fleet which totals over 50 machines (excluding LDVs). It includes 15 excavators, 38 rigid tipper trucks (of Chinese manufacture), six Bell B40 articulated dump trucks, as well as ancillary equipment such as dozers, water bowsers and graders. Because ACF’s tenements extend for a distance of around 30 km along the Great Dyke, with the mining sites being scattered over a large area, the company has elected not to have a central plant for processing the ore. “A single processing facility would not be economically feasible, given the distances involved,” explains Richardson. “So we’ve chosen to rather place wash plants at each mining site. We’ve gone for a modular, semi-mobile design as generally our sites only have a life of three to five years before we move on to fresh mining areas. In all, there are seven plants on site which collectively incorporate 15 spiral plant modules, with each module having a 45 t/h capacity. All the plants have been put in since ACF – under its present ownership – started operations in 2014 with the exception of what is known as the pilot plant, which was originally erected by a previous operator at the site and has been refurbished by ACF. Each new plant put in has built on the experience gained with its predecessors. The newest plant – Plant 6 – was commissioned in April this year and is a four-module facility, the largest to date. Further capacity is on the way and it is envisaged that a total of 19 modules will be operational by year’s end. Currently, the seven plants are producing about 30 000 tonnes of product per month – which is marketed through Glencore – but will eventually ramp up to a capacity of 50 000 tonnes per month. Plant 6 has been equipped with two high-rate tailings thickeners – supplied by South African company Magra Process Engineering – which allow for the recovery of around 80 % of the process water. A further benefit derived from the use of the thickeners is that the tailings from the plant now dry out faster. This means that the material can be returned to the mining sites – where it is used in rehabilitation – much sooner than was previously the case. ACF is currently busy with a programme to retrofit the thickeners to all the other plants. Each plant has its own mining village, with accommodation – mainly containerised – being provided for approximately 900 employees. Electricity is supplied from gensets as the entire ACF operation is off-grid. The gravel road network connecting the various sites totals over 80 km. ACF is operated by the Moti Group, which is the majority shareholder of the company. Sakunda Holdings (Pvt) Ltd is the minority shareholder. Moti was founded by South African entrepreneur Zunaid Moti, who has built up a business empire encompassing not only mining but also property, aviation, security and financial services, and transport and logistics. The Group says it has already invested around US$250 million in Zimbabwe and will be doubling this to make it one of the biggest foreign investors in Zimbabwe’s economy.